A wardrobe isn’t the only thing I bought at Ikea over the weekend, I also picked up a bed! As glamorous as the mattress on the floor was, I was really, really tired of it. I’ve seen pictures of spaces with mattresses on the floor that look amazing, but it wasn’t for me. It’s called FJELLSE, and at $50 (plus another $50 for the slats, not pictured), it couldn’t really be beat. But those of you that have been reading along or know me could probably figure out that this basic pine bed frame won’t stay a basic pine bed frame for long. Oooo anticipation. 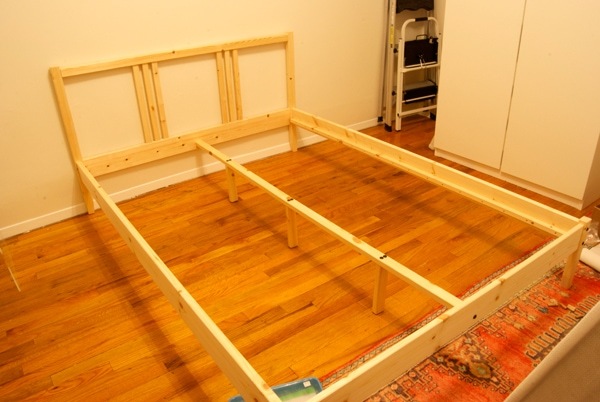 EDIT: To see what became of the FJELLSE bed after a hearty round of DIY, click here. EDIT: For those of you who stumbled over here looking for a review or information on the Fjellse bed, please read the comments on this post! The long and short of it is, I like it. Don’t be afraid to ask more questions, either– I’ll try to answer them promptly. I was under the impression that the FJELLSE didn’t come in a standard queen size (?). I mean, that’s been the only thing keeping me from shamelessly and immediately copying your little upholstery project. Hmmm, I don’t think it does! Annoying! Some people have done the upholstery project using this bed instead, just cut off the protruding parts on the top of the headboard! That is boss! I bought a Fjellse (on the way) to replace my old bed that the movers ruined, but I will probably just paint mine and mod the headboard a bit. Unfortunately I no longer live near an Ikea, so I had to have it shipped. Just wondering what the clearance is underneath the bed? I am considering getting an Odda storage box to use underneath, but I was not sure if the box would be too tall. PS, I do want to carry out your ridiculously fantastic DIY on the bed, so not using the headboard as-is would not be an issue. I just bought the twin size version and the instructions for the slats i bought show that I should have cross bars installed on the frame. How do I do that with this frame? there weren’t any provided by Ikea! Hi Daniel, I love that you post this b/c I am searching for a quick 5 month bed for a studio apt…. Found you by typing in Fjellse. Did you use a base or is that just the full mattress sitting ontop of that slat? I tried to read all the comments to see if you stated that or not, I didn’t see. Hi Daniel – so it’s over 1 year later, how’s the bed held up??? I’m thinking about buying this bed,but i heard that it breaks apart after about a year, of your expereience, do you think this is true?